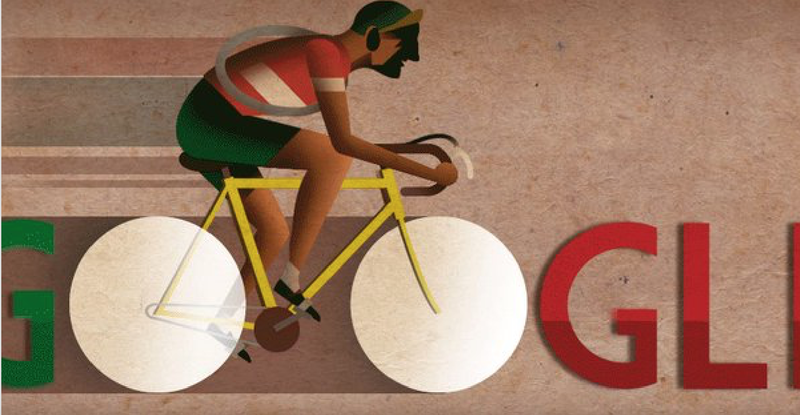 After honoring the Belgian priest and man of science Georges Lemaitre, “Father of the Big Bang theory” on July 17, on July 18, 2018, Google paid homage to another great Catholic, Gino Bartali, and it’s not insignificant right in the middle of the Tour de France. Bartali won the Tour de France before and after World War II, within a 10-year gap, in other words, an exploit. And during the War, his reputation enabled him to cross the German lines: the name Bartali alone impressed all! On September 23, 2013, the name of the Italian cyclist champion Gino Bartali (1914-2000) was added to the thousands of names inscribed in the Yad Vashem Memorial of the Shoa in Jerusalem. He put his legs, his heart and his intelligence at the service of persecuted Jews during World War II. Under the pretext of training, he whom the whole world acclaimed just before the War, in 1938, for his victory in the Tour de France, passed, in his bicycle — his handlebar and saddle — false papers that saved lives. The decision to honor him with the title “Righteous among the Nations” was taken on July 7, 2013 (Cf. Zenit, August 16, 2013). L’Osservatore Romano announced the news at the time in the columns of its daily Italian edition on September 23-24, 2013. The latter was also declared Righteous among the Nations in 2012. His Cause of Beatification was taken up by the Catholic Church, which recognized him “Venerable” in May 2017. A native of Florence, Gino Bartali won the Giro of Italy in 1936, 1937 and 1946, and the Tour de France on the eve of the War, in 1938, and ten years later, in 1948. He was an internationally known hero when the War broke out. His son, Andrea Bartali, said that Archbishop Dalla Costa married his parents and continued to have friendly relations with them. When Nazi Germany occupied Italy in 1943, Bartali, who was a courrier of the Resistance,” played an important role in the rescue of Jews within the network launched by Dalla Costa and Rabbi Nathan Cassuto,” specifies Yad Vashem. He transported documents wherever it was necessary also in contact with the convent of Assisi and the Catholic rescue network organized in the Poverello’s city. When Bartali was stopped by people, he said that in no case should they touch his bicycle, whose different parts were carefully balanced, in view of attaining maximum speed. If German soldiers stopped him, he said he was “training” and they let him go, full of admiration for his sports exploits. Giulia Baquis testified at Yad Vashem that she and her family hid at Lido di Camaiore, in Tuscany, during the Occupation. One day, a cyclist arrived, bringing a package: he was looking for her family. The eldest sister was absent, the second was afraid and denied she knew the family. He left without taking back the package. It was after the War that a member of the rescue network confided to the Baquis family that the courrier was Bartali. Renzo Ventura said he heard his mother Marcella Frankenthal-Ventura say that she and her parents and her sister received false papers brought by Bartali on behalf of the Dalla Costa network. The Goldenberg family met Gino Bartali in 1941 at Fiesole. Shlomo Goldenberg-Paz was nine years old. He said he remembers a meeting with Bartali and Armando Sizzi, a parent and close friend. Both had a “discussion between adults” with Shlomo’s father. He remembers the visit well because the champion had offered him a bicycle and an inscribed photo that he always kept with him. With the Occupation, beginning in 1943, the Goldenbergs had to hide. Shlomo was entrusted to a convent before being reunited with his parents, who were hidden in a Florence apartment belonging to Bartali, occupied by Armando Sizzi, but Goldenberg testified that it was Bartali who came to their aid. One of his cousins, Aurelio Klein also fled to Florence in the hope of obtaining false papers. He stayed with the Goldenbergs until he left for Switzerland thanks to false papers. He testified that Shlomo Goldenberg’s mother received false papers from Bartali himself and that she was the only one of the family who dared go out of the apartment and go shopping. After the War, Bartali never spoke about his clandestine rescue activities, many of which, consequently, are unknown. Sara Corcos, who worked with the Contemporary Jewish Documentation Center of Milan, told her niece, Shoshan Evron, daughter of Rabbi Nathan Cassuto, that she met Gino Bartali after the War. He refused to be interviewed and said he was motivated by his conscience and that, consequently, he did not want files made on his activities. It wasn’t until Mrs. Corcos confided to him that she was a relative of Rabbi Cassuto that Bartali, very moved, agreed to talk, on the condition that she didn’t record what he said. He then told her about the false papers and his role in distributing them. Here is, in brief, the reason for the “Doodle” and Greg Burke’s homage.